Fabulous weather, large fields, a huge crowd, and tight points battles made for a perfect finish to the Mickey Thompson MiRock Superbike Series at Steve Earwood’s Rockingham Dragway in the sand hills of North Carolina. 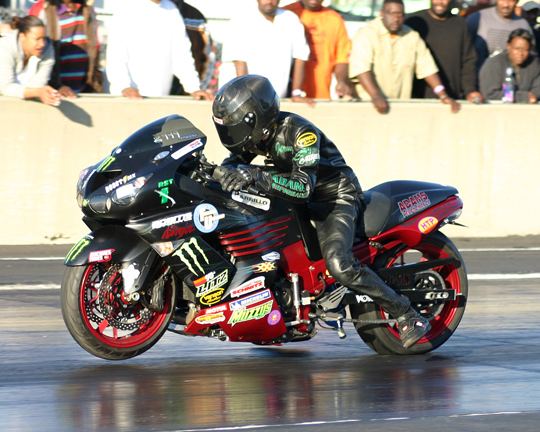 Jeremy Teasley beat Adams Performance team boss Coby Adams in an all-Kawasaki ZX14 HTP Performance Real Street final. Running a comparatively mild motor this time around, Teasley used superb, consistent riding to make his way through the competitive field. 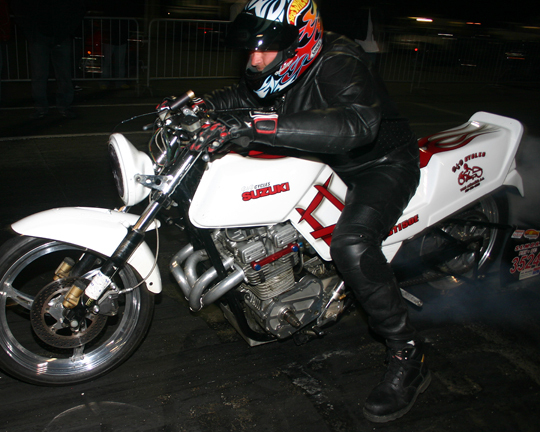 On board Roger Starrette’s blue ’14, builder/tuner Adams was getting reacquainted quickly to riding a big bore bike with a big shot of nitrous. By the end of the weekend Adams was smooth as silk, but not strong enough to get past Teasley. 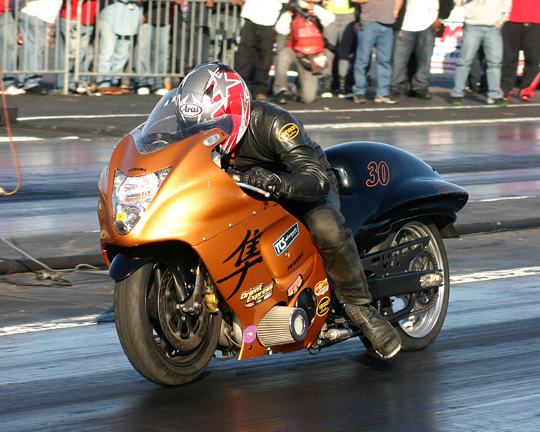 HTP’s own Keith Thompson took his second straight Real Street championship on his Suzuki GSXR1000 despite spinning off the starting line and losing to Adams in round 2. Thompson was once again without HTP builder/tuner Cecil Towner III, who rushed back to Richmond, Virginia on Friday for the birth of his first child. Former Pro Sportbike champ Vinnie Demito and rival Rodney Williford both moved up this year to the 68 inch Orient Express Pro Street class. Williford won the first race of the year, Demito the second, and so began a season long points battle that neither seemed to want to win. Demito struggled with the MTC Gen2 clutch and Williford lost the tune-up when he changed fuel systems. In stepped perennial champion of everything Mike Slowe, who threatened to steal yet another Pro Street crown. But Williford and Demito rose up to the challenge at The Rock, meeting in the final and vanquishing Slowe’s hopes despite Mikey’s number 1 qualifying 7.17. Slowe spun and lost to Williford in the semi. Then in a virtual replay of the April final, Demito spun wildly off the line and Williford powered to the win. 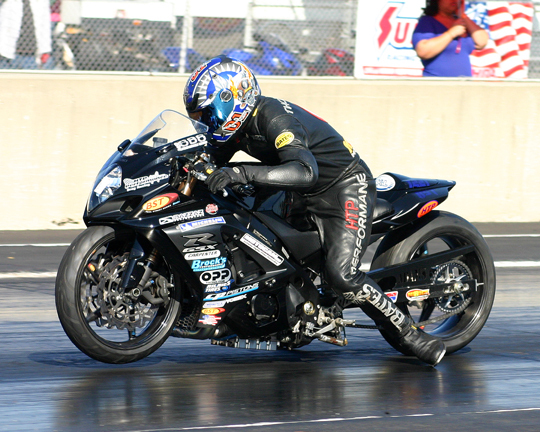 Sean “Skinny” Walsh won the last Pro Sportbike race ever over trailermate Anthony Navarro, the number 1 qualifier. Walsh led from start to finish, but Navarro reclaimed the class title that he “loaned” to Demito the last couple of years. The new Crazy 8s index class made another popular showing, and this time Brandon Tyree beat Ernest Lassiter in the final round of the 35 bike field. Eatonton, Georgia’s Baybay Yarbrough beat Richmond, Virginia’s Lavar Lewis in FBR Shop Quick 32. 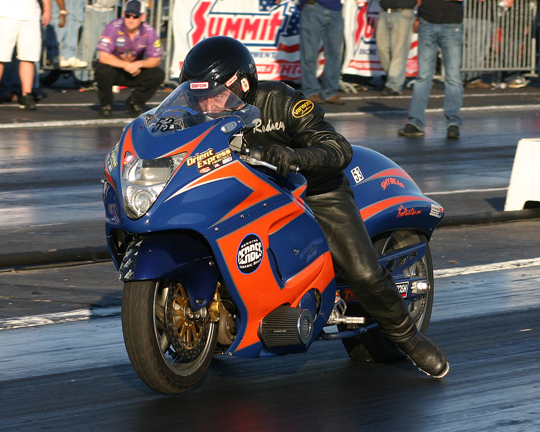 The Honda-Suzuki of Sanford 5.60 final went to Jason Herron over Curtis Griggs, and Herron also claimed the season title. Jay Windsor beat Shayne Proctor in Saturday’s Nitrous Express Pro ET final, while Crazy 8s runner-up Lassiter beat Fun For All’s Ron Arnold on Sunday. World famous twin Barry Purnell beat Travis Boudreaux in Saturday’s Schnitz Racing Street ET final, and brother Gary celebrated the win excessively. Sunday’s final went to Randolph “Boo” Brown Jr. over Sherrell Blake. And Andy Smallwood took Real Street B over Darion “Nanu” Payne. Grudge racing was hot and heavy at The Rock, with local favorite Johnny “Airtime” Locklear cleaning up whenever he had the chance. Real Street winner Teasley split two aboard Greg Wallace’s “Now and Later” 1000 against Caleb McDougald.